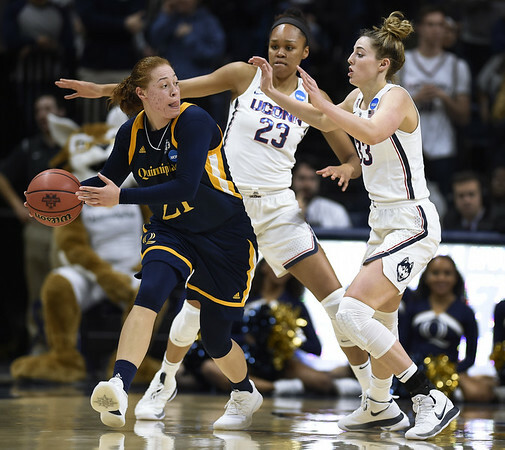 STORRS - For the first time in seven years Monday night, an NCAA Tournament second-round opponent came within 25 points of the UConn women’s basketball team. The top-seeded Huskies’ 71-46 win over No. 9 Quinnipiac at Gampel Pavilion featured the smallest margin of victory since a 24-point triumph over Purdue in Maya Moore’s final home game in 2011. And while UConn has won games more comfortably, it got more out of its matchup with the Bobcats than the score could indicate. “It was a halfcourt game so we had to grind it out,” UConn forward Azura Stevens said. “We did a good job with that. We had our hands up defensively, and we knew who their go-to players were who liked to get to the basket or kick it out for threes. We did a good job defending that. The Huskies (34-0) will play in their 25th consecutive Sweet 16 on Saturday when they take on fifth-seeded Duke (24-8) in a regional semifinal at the Times Union Center in Albany, New York. UConn never trailed and seven unanswered points gave it a 9-2 lead. But Quinnipiac stayed with its game plan of taking time off the clock offensively and clog things up in the lane on the Huskies defensively. It was a far cry from Saturday’s first-round game when No. 16 Saint Francis of Pennsylvania launched a tourney record 57 3-point shots and let UConn run fast and free in a 140-52 victory. The Huskies led by double figures for the final 24:32 and by 15 at halftime Monday night. Ahead 41-27, UConn got a jumper from Katie Lou Samuelson, a 3-pointer from Kia Nurse, and two free throws from Stevens for a 21-point lead. At that point, Quinnipiac - to its credit instead of just trying to manage the score and not let the game become a complete rout - opened up its offense trying to get back into the game. It was 54-31 going to the fourth quarter and the Bobcats got no closer, with two more Stevens free throws giving the Huskies their biggest lead at 31 with 3:11 to go. “We just had to chip away at them and we knew if we kept working hard we’d get the lead that we wanted,” UConn forward Gabby Williams said. Quinnipiac committed just seven turnovers and played UConn even in points off of turnovers (8-8). The only fast-break points of the contest came on a layup by Collier off a pass from Crystal Dangerfield for the final points of the third quarter. But the Bobcats shot just 30.4 percent from the floor. The Huskies, meanwhile, connected on 59.1 percent of their shots and had 18 assists attached to their 26 baskets. Collier led the Huskies with 23 points and was 20-for-24 shooting from the floor in the two sub-regional wins. Stevens added 14 points and was 16-for-22 shooting in her first NCAA Tournament games since her freshman season at Duke three years ago. UConn returns to the Times Union Center for the first time since 2015. Behind regional Most Outstanding Player Breanna Stewart, the Huskies routed Texas in the Sweet 16 then overcame a one-point halftime deficit to defeat Dayton to advance to the Final Four. Second-seeded and reigning national champion South Carolina will face upstart No. 11 Buffalo in the first semifinal Saturday. The South Carolina-Buffalo and UConn-Duke winners will play for a spot in the Final Four in Columbus, Ohio, this Monday night. Posted in New Britain Herald, UConn on Wednesday, 21 March 2018 16:43. Updated: Wednesday, 21 March 2018 16:46.